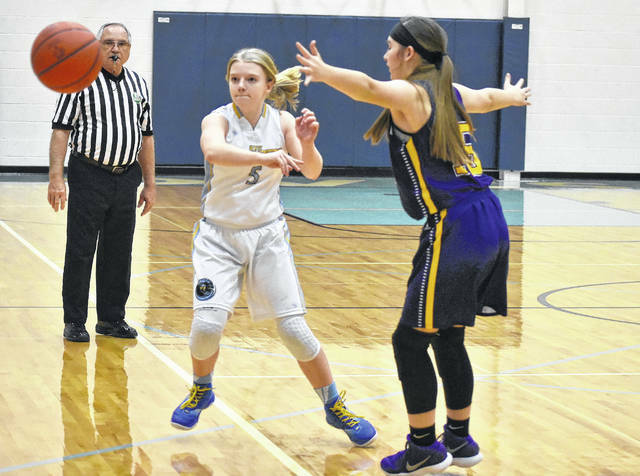 Ohio Valley Christian freshman Lauren Ragan (5) fires a pass to a teammate during the second half of Friday night’s girls basketball contest against Ironton Saint Joseph in Gallipolis, Ohio. 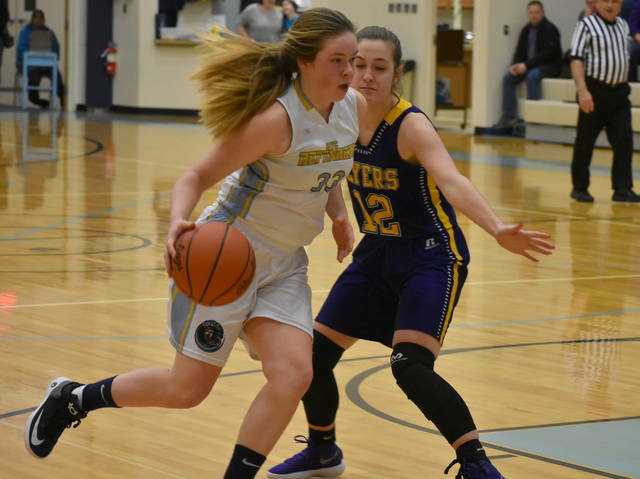 GALLIPOLIS, Ohio – The Lady Defenders took to the court for the first time in 2018 as they played host to the visiting Ironton St. Joseph Lady Flyers on Friday night, with both teams searching for their third overall win of the season. 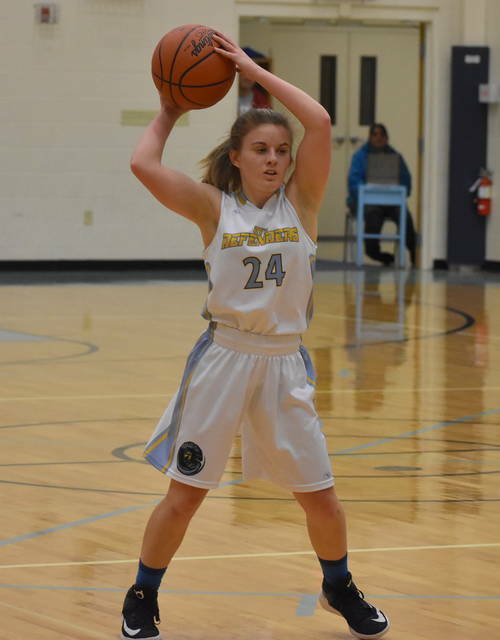 Unfortunately, the Ohio Valley Christian girls basketball team shot just 5-of-30 from the field and made only 1-of-11 three-pointers en route to a 31-21 setback. The Lady Defenders (2-8) ended the first half of play trailing the Lady Flyers (3-6) by a score of 19-13. Ironton St. Joseph established its early lead on the heels of Alyson Johnson’s 13 first half points. Johnson led all scorers in the game as she finished with 17 points. For the game, OVCS shot 8-of-17 from the free throw line for 47 percent. In contrast, Ironton St. Joseph shot 5-of-15 from the charity stripe for 33 percent. The Lady Defenders pulled down a total of 23 rebounds. The Lady Defenders were led in scoring by senior Cori Hutchison and Emily Childers, as each scored seven points in the contest. Following the game, OVCS girls varsity head coach Chris Burnett assessed his team’s performance. Kristen Durst followed both Hutchison and Childers with four points, while Yuyan Sun and Olivia Neal completed the Lady Defender tally with two points and one point, respectively. Ashley Bartram, Emma Whaley and Faith Mahlmeister followed Johnson with four points apiece, while Emilee Blankenship completed the winning tally with two markers. OVCS will return to the hardwood on Tuesday as it faces Wood County Christian.